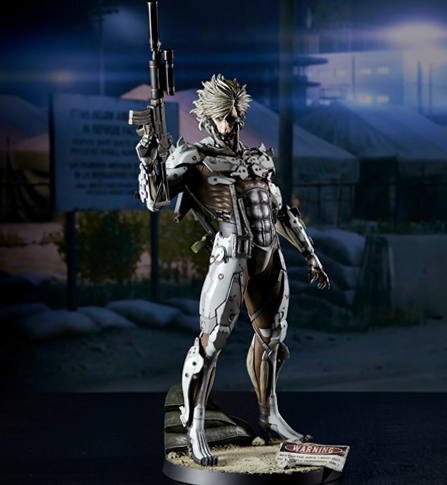 METAL GEAR SOLID V: GROUND ZEROES "JAMAIS VU" / RAIDEN 1/6 Scale Statue, White Armor Ver. figure for San Diego Comic-Con 2015. His usual weapons, the blades and scabbards, are changed to the giant rocket launcher on his back and the assault rifle in his right hand. The assault rifle can be displayed with or without the suppressor. The base features sandbags piled high and a fallen sign, representing a classic stage of the video game. The eye glows red with a mounted LED in the head. The effect of "Augment Mode" is added on the visor. ※This is for SDCC 2015 attendees only and will be available at Gecco booth for pick up. For those who cannot attend SDCC, the limited quantity will be distributed by the following distributors. Pre-order will start on May 11th. The goods will be shipped in the end of July.